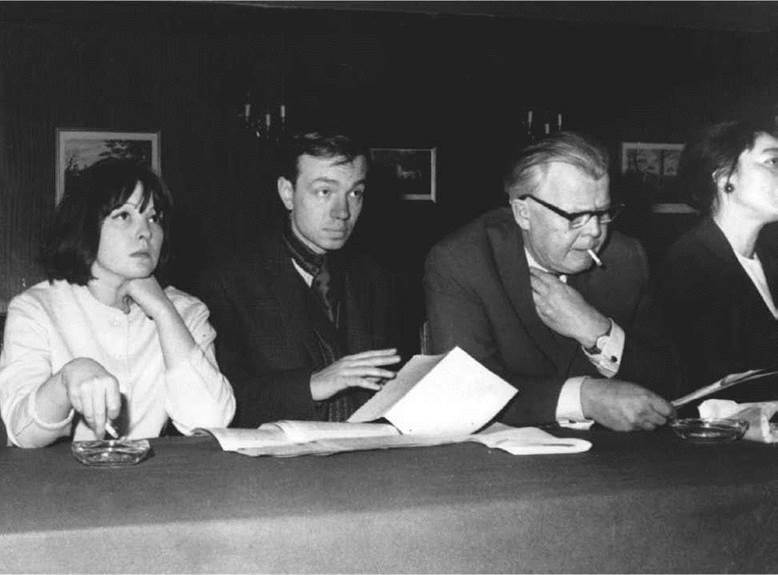 Bella Akhmadulina (left), sitting with Voznessenski, Tvardovski, and Zolina. Akmadoulina, Bella, photograph. AP Images. Considered one of the foremost contemporary Russian poets, Bella Akhmadulina’s poetry reflects the challenges of creating literature under a repressive Communist regime. Also a noted translator of poems, especially from Georgian, she favors traditional forms and introspective topics. Born in Moscow the same year that Soviet dictator Joseph Stalin conducted purge trials of Soviet officials he believed to be disloyal, Bella Akhmadulina attended the A. M. Gorky Institute of World Literature in the mid-1950s. She was married first to the poet Yevgeny Yevtushenko, then to the writer Yuri Nagibin, before marrying the artist Boris Messerer in 1974. Early Collections Lauded by Critics. Akhmadulina, a member of the ‘‘new wave’’ writers who were influenced by Western ideology, began to publish poetry in the early 1960s. During this period, the Soviet Union was engaged in the Cold War with the United States while a still-repressive Communist regime ensured Soviet society operated under many government-mandated restrictions. Though Soviet leader Nikita Khrushchev attempted to correct the excesses of his predecessor, Stalin, in the late 1950s and early 1960s, there was only limited intellectual freedom. Akhmadulina’s first two collections, String (1962) and Music Lessons (1968), contain what many critics regard as her finest poems. ‘‘Fever’’ and ‘‘Tale of the Rain,’’ two of Akhmadulina’s most celebrated early poems, convey her belief that creativity has a liberating effect on individuals yet leads to scorn and alienation from society. In other noted poems from these volumes, Akhmadulina pays tribute to such literary predecessors as Anna Akhmatova, Mariana Tsvetaeva, Mikhail Yuryevich Lermontov, and Alexander Pushkin. In the poem ‘‘I Swear,’’ she vows to destroy the social forces that drove Tsvetaeva to commit suicide in the city of Yelabuga in 1941. A Dry Spell. Akhmadulina wrote very little in the 1960s and 1970s. Her works after ‘‘Tale of the Rain’’ explore the themes of sickness, insomnia, and suffering over her inability to write in an atmosphere of muteness, shadows, and darkness. The Soviet regime of this period was more repressive as Khrushchev had been overthrown by a conspiracy of Communist party leaders and replaced by more hardline Communists. Dissenting members of the intelligentsia were often targeted by the new leadership’s campaigns. In the mid-1970s, however, Akhmadulina’s poems again began to appear regularly in the press and in a number of collections. In these poems some of her old themes and images reappear, but new ones also gradually emerge. Added Theme of Spirituality. In her recent works, Akhmadulina returns to her main themes: her love of foreign lands—especially the country of Georgia; evocations of the past through visions of the specific Russian poets who influenced her; and the joys and rewards of friendship. While they always showed a profound sense of integrity and morality, her poems now are acquiring an even deeper spiritual cast. Almost Romantic in tone, Akhmadulina’s poems find God and virtue in nature. Throughout her career, she has been able to transform the mundane into the whimsical, the sublime, and the wonderful. By the early 2000s, her poems had become more mature and reflective. Joseph Stalin (1879-1953): Communist ruler of the Soviet Union from 1922 to 1953, responsible for rapid industrialization and also many deaths from famine and executions. Rudolfo Anaya (1937- ): Mexican American author best known for writing Bless Me, Ultima. Bulat Okudzhava (1924-1997): Russian poet who helped start the ''author's song'' genre of bardlike musical performance. Madeleine Albright (1937- ): First woman to become United States secretary of state in 1996. She was nominated by President Bill Clinton and unanimously confirmed by the United States Senate before being sworn in on January 23, 1997. Yevgeny Yevtushenko (1933- ): Akhmadulina's exhusband, a Russian poet who was one of the first to denounce Stalinism. While traditional in form, Akhmadulina’s poetry is distinguished by her wit, emotional intensity, and inventive use of rhyme, syntax, and imagery. Consistency of formal devices, as well as symbolism, is also evident in Akhmadulina’s poetry. The metrics of her poems are not distinguished by any new experimental forms. Rather, she gives freshness and variety to the traditional forms. Akhmadulina’s early verse is characterized by her exuberant use of extended metaphors that impart a sense of wonder to ordinary objects and events. Her later poems often express melancholy or pensive moods and examine such subjects as aging and the loss of creative powers. Flowers. For Akhmadulina, flowers have always represented poems. In her early lyrics, they grow in greenhouses, protected from the elements. As she becomes more daring as a poet, she finds herself more often in gardens where the flowers grow in the open air. Flowers act simultaneously as the source of inspiration as well as its result—the poems themselves. One entire volume is called The Garden (1987) because each poem is a flower lying within its pages. Love. Akhmadulina’s love poems share a recurrent symbolism. She finds refuge from her alienation from the crowd either in poetry or with her lover. In most cases, the man she loves shares her inspiration. Where most poets look to love for inspiration, Akhmadulina looks to inspiration for love. An excellent illustration of this symbiotic relationship between love and inspiration is the poem ‘‘December,’’ in which the speaker and her lover are building a snowman, and a crowd gathers around them to watch their actions. Friendship. The constant need to be alone with friends is more prevalent in her later poetry. In ‘‘I think: how stupid I have been’’ (1967) she is to meet friends at six o’clock in a cafe. Because her watch is fast, she arrives before the others. While she is waiting she enumerates their good qualities and finally comes to the conclusion that she is ‘‘afraid to be alone.’’ Akhmadulina also seeks the company of friends when she can no longer endure the futility of trying to write. Akhmadulina’s search for solace in the company of friends is a logical result of her predicament—especially since poetry and lovers often are not there when she needs them. Influence on Other Writers. As part of the ‘‘new wave’’ of writers, Akhmadulina is considered an important Russian poet and perhaps one of the most popular Russian woman poets of her generation. Her influence can be seen on the poets from her country who followed her literary tradition. Many of Akhmadulina's poems refer to the process of writing poetry. This technique of calling attention to the form itself is a common writing device, which works to get the reader or viewer to focus on the artistic endeavor as well as the content. Here are some other works that detail the creative process in the work itself. Tristram Shandy (1759), a novel by Laurence Sterne. The title character attempts to tell his life story, but is so meandering that this novel becomes more about the futility of telling one's life story. Pale Fire (1962), a novel by Vladimir Nabokov. A fictional editor publishes and comments on a poem by the fictional poet John Shade, which takes the form of this fictional novel. Adaptation (2002), a film directed by Spike Jonze. In this movie, a screenwriter is writing a script about a book which is too complicated to be turned into a script. Akhmadulina’s distinctive poetic voice, lively style, and original use of themes have been praised by critics. They also commend her witty use of metaphor to comment on society and the natural world and her ability to create and sustain her personal perspective in her poems. In addition, her stylistic and thematic variety is held in high regard. 1. Akhmadulina claims she doesn’t write political poems, but can you find evidence to the contrary in her earlier poems? 2. Track the changes in two of her favorite symbols, flowers and dogs, over the years of her poetry. 3. Which do you think Akhmadulina values more, love or friendship? Give evidence citing a few of her poems in Fever, and Other Poems. 4. Akhmadulina celebrates the Georgian countryside in many of her poems. What in particular does she seem to like about this place? 5. Akhmadulina owes much of her expression to Russian writers like Pasternak and Pushkin, Akhmatova and Tsvetaeva. What do these writers have in common, stylistically? Chevalier, Tracy, ed. ‘‘Bella Akhmadulina.’’ In Contemporary World Writers. Detroit: St. James Press: 1993, 7-9. Feinstein, Elaine. ‘‘Poetry and Conscience: Russian Women Poets of the 20th Century.’’ In Women Writing and Writing about Women. New York: Barnes & Noble, 1979[BAI]. Ketchian, Sonia. The Poetic Craft of Bella Akhmadulina. University Park: Pennsylvania State University Press, 1993. __________. ‘‘The Wonder of Nature and Art: Bella Akhmadulina’s Secret.’’ In New Studies in Russian Language and Literature, ed. Anna Lisa Crone and others. Columbus, Ohio: Slavica, 1986. Loseff, Lev, and Valentina Polukhina, eds. Brodsky’s Poetics and Aesthetics. New York: St. Martin’s Press, 1990. Condee, Nancy P. “Akhmadulina’s POEMY: Poems of Transformations and Origins.’’ Slavic and East European Journal 29, no. 2 (Summer 1985). Ketchian, Sonia. ‘‘Poetic Creation in Bella Akhmadulina.’’ Slavic and East European Journal 28, no. 1 (Spring 1984). Rydel, Christine. ‘‘The Metapoetical World of Bella Akhmadulina.’’ Russian Literature Triquarterly 1, no. 1 (1971). Soviet Literature. ‘‘Have the Poets Yielded Their Former Positions? (A Talk with Bella Akhmadulina).’’ 6 (1988).